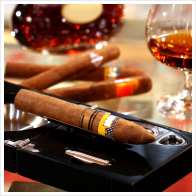 Smoking cigars have been around since as early as the 10th Century. Cigars have been shrouded in controversy, with recent developments in taxation and restrictions it is unclear where the industry will "end-up". 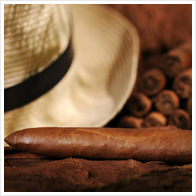 This is a brief overview of the history of the cigar. When Christopher Columbus was on an expedition in the Caribbean he observed the natives (the indigenous people of San Salvador, Bahamas) smoking an unknown substance. This substance was either, smoked through a tube, called a Tabago, or rolled up in a large leaf. Columbus and his crew took some of this tobacco back to Spain, where techniques for rolling cigars and making pipes were rapidly perfected. This custom of smoking tobacco in cigars and pipes swiftly swept Europe and, within a short space of time, the rest of the World embraced it. During the Late 1800's many of Cuba's top cigar producers migrated to Florida and helped to set up the Tampa cigar industry. The City of Ybor in Tampa, Florida grew to become the Cigar Capital of the World, as this insurgence of Cuban Cigar manufactures lead the town to having in excess of 60 factories. It wasn't until the 1950's that Ybor lost its status and gave way to a more free and open international market. In 1962, at the height of the Cold War, Cuba allowed the Soviet Union to set up multiple nuclear missile bases in preparation for an attack on the United States. This situation, known as the 'Cuban Missile Crisis' has been regarded as the closest the world has been to nuclear war. President John F. Kennedy authorized a trade embargo with Cuba as a result of the crisis. This Embargo meant that products of Cuban origin were no longer to be leagaly available to United States Citizens. The initial introduction of the Embargo had an almost devastating effect on the Cuban Cigar industry but has now proved to give Cuban Cigars a stigma and has even helped boost their popularity. 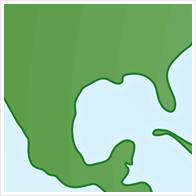 The Trade Embargo is still in place in the US. After a few decades of slowing sales and a severe lack of interest in trade, the sales of cigars exploded, causing the Cigar Boom of the mid 1990's. Cigars became fashionable and stylish, largely due to their representation in the media. 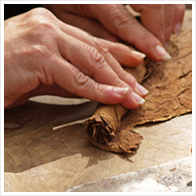 The boom did eventually level out until another surge in popularity between 2000 and 2004, when cigar sales in the United States alone grew by 28%. The future for the cigar industry is unclear due to higher taxes and more restrictions on public smoking.